Spectacular new construction that sleeps 15 people with 8 flat screen TV's, 3 gas burning fireplaces, hot tub, jacuzzi bath tub, and a game room with pool table! This amazing home is perfect for vacations with 5 bedrooms downstairs along with the game room. The game room has a 50' flat screen TV, XBOX 360, pool table, card table, and a wet bar with bar stools for 4. Step outside from there and find the large hot tub backing to a very private wooded area. Upstairs is the huge open great room with travertine floors, enormous kitchen with granite countertops, living area with 50' flat screen TV, deck with gas barbecue, the master suite with private bath and large jacuzzi bath tub, and front deck with filtered mountain views! This one-of-a-kind home is perfect anytime of year! 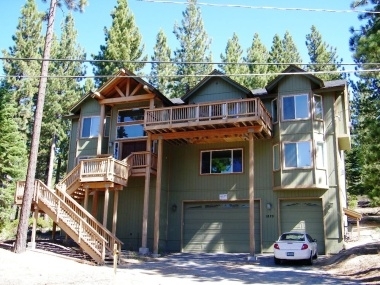 Only 10-15 minutes from beaches, casinos, and skiing at either Heavenly or Sierra-at-Tahoe! Not to mention hydronic heated floors! Bedroom 6 1 Double, 1 Single/Twin	 3 Bunk beds: double on bottom, single on top. There is a sofa bed available for additional guests.